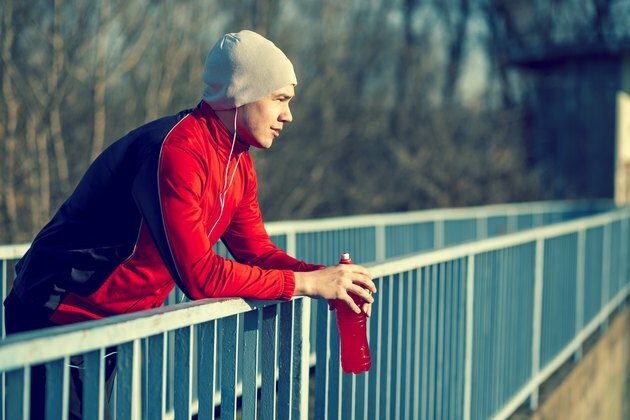 Sports drinks have long been used to supplement athletes during and after exercise. Gatorade, much like other sports drinks, has nutrients that water does not provide to the body. Although it can be unhealthy when consumed by inactive people, drinking Gatorade after long workouts can have a beneficial impact on your body. Exercise uses up fuel and resources stored in your body. To keep your body operating efficiently and safely, replace these resources regularly both during and after exercise. Exercise requires energy to fuel your workload, and this is drawn from fat deposits, carbohydrates and other resources in your body. Exercise also creates heat and prompts your body to sweat to cool itself. Sweating causes a loss of water and fluids and can lead to dehydration if they are not replaced. Over long periods of exercise -- 60 minutes or more -- electrolytes can also be lost. Gatorade, like many other sports drinks, uses flavoring and sugars to make the drink more appealing to the palate. But sugars aren't there merely for satisfaction: drinking Gatorade after a workout helps to boost carbohydrates and blood sugar levels in your body. It also replaces fluids lost while sweating. Electrolytes, which help regulate your body's pH balance, are also provided through sports drinks. Workouts lasting for less than 60 minutes are best served by drinking water when you're done rather than a sports drink. Also drink water consistently during your workout to avoid dehydration. For workouts lasting an hour or longer, sports drinks like Gatorade can help replenish your body's fluids while also providing sugars and electrolytes to boost your energy levels. Aim for 2 to 3 cups of Gatorade, water or a combination of the two for every pound lost during exercise. According to CBS News, recent research published in the "International Journal of Sport Nutrition and Exercise Metabolism" revealed that chocolate milk may have greater benefits to the body's post-workout recovery than Gatorade and other sports drinks. This is because of the protein found in milk, which helps muscles recover, as well as the calcium, vitamin D and sugars. However, the study was limited, and more studies are needed to determine whether chocolate milk is actually superior to Gatorade. CBS News: Chocolate Milk: The New Sports Drink? Regular Milk or Chocolate Milk for Post-Exercise?